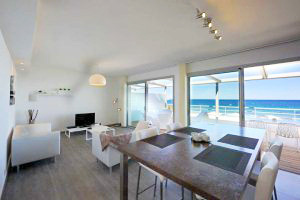 A truly luxurious beachside self-catering holiday, with use of a shared pool area. 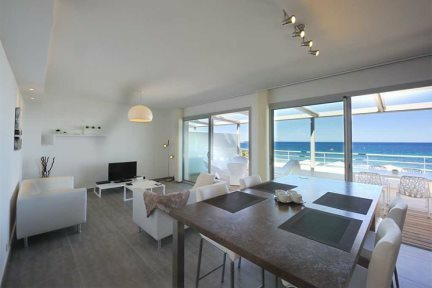 Résidence Dary presents six luxury apartments, positioned directly on the beach, affording fabulous views across the Ligurian Sea. Finished to the highest standard and arranged in a contemporary style, the interior features a combination of open living space, modern facilities and sleek furniture. The décor is soothing; a mix of neutral shades has been carefully used to create a relaxed atmosphere and comfortable feel throughout. Whilst you may want to take advantage of the exquisite sweep of white sand in front of the apartments, there's also a shared heated pool on site along with ample sunloungers and parasols – an inviting corner to relax in should you want to escape the crowds of the peak summer months for a time. And for an evening out, try the owner's well reputed restaurant l'Acula Marina, a sophisticated beachside restaurant with fantastic views over the bay and a relaxed setting (10% discount for residents). The résdience is only a stroll away from L’Ile Rousse town centre, with its excellent local shops, its quintessentially French café terraces and traditional restaurants. Secured parking is available should you wish to hire a car to explore the hidden corners of la Balagne's hills. "We felt very well looked after in luxurious accommodation." Open-plan living/dining room with well-equipped kitchen area, double bedroom with en-suite bathroom with shower with wc, twin room, shower room with wc, large terrace. Shared heated pool (12m x 4m, depth 1.5m-1.7m), parking, washing machine, dishwasher, microwave, television, DVD player, hi-fi, Wi-Fi, breakfast can be served in the apartments at a supplement of €15pp (reserve locally 24hrs in advance). Apartments located on the ground floor with a balcony and views across the pool towards the sea..
Apartments located on the first floor with a balcony and fabulous views across the bay.